One of the common culture shocks you can experience in South-East Asia centres is the subject of food. If you’re visiting a South-East Asian country, you will notice that on a lot of street corners there’s someone selling food on a stand – cooked right in front of you, be it day or night. The food markets are the most popular places to eat for both locals and tourists – it’s specific, it’s cheap, it’s delicious and it’s fast. Don’t frown, thinking what would the Westerners say about the sanitary regulations. You should know that, generally speaking, it’s safe to eat there and it can turn out to be a Michelin-starred experience in its own way, even if the food might look unusual. However, at first sight, there’s a good chance you’ll experience some culture shocks. Good cooking doesn’t even need running water. At first, you might be wary of eating street food, prepared on the counter and made on the spot at an improvised fire on the curb. But this is one of the most important parts of the South-East Asian culture, so it’s best to just dive in and go with it. Once you taste the food, you’ll be back for seconds, thirds and maybe more. One of the most adventurous things you can eat in South-East Asia street markets are the bugs. All types of crawling and flying critters are fried and edible, for a small fee. You will eventually get used to seeing them served in a tray, right next to your dish of choice at the food stand. But the truth is that locals don’t actually eat bugs. Tourists think they do, so they try them to experience local culture. It’s a funny misunderstanding that has led to one of the most talked about culture shocks. South-East Asia is a paradise for fruit lovers; you can find so many delicious varieties for cheap prices that you might seriously consider turning vegan for the remainder of your visit. Some of them look and smell weird, but the king of them all is the durian, a fruit that smells so bad eating it indoors is forbidden in most countries of the continent. You can still find it at street stands or in durian orchards in Malaysia. Keep an eye out for a large fruit looking like a hedgehog and giving away a strong stench of onion. The locals who make and sell street food usually come in the morning and leave at night. To be able to match public demand, they pluck the chickens and ducks, boil or fry them whole, and then they leave them hanging on the stands until it’s their turn to be chopped and mixed in a dish. The sight is not pleasant, and it can cause distress to a vegetarian or a vegan. Something else to consider: eating meat that has been left hanging outside near a dusty road at 40 degrees Celsius is perhaps not the healthiest thing in the world to do. You can choose to ignore this aspect during your holiday, enjoy other cuisines, or ask for the vegetarian versions of the meals. For those of you who can’t stomach Asian food or don’t trust it, there are also plenty of Western fast food restaurants. Locals don’t usually go there, because the prices are the same as you would find at home, which is far too expensive for them and a lot more expensive than the local street food. Generally speaking, South-East Asia is a very cheap holiday destination until it comes to imported items. The first rule about eating time in South-East Asia is that there are no closing hours. Food is available at any hour during the day and night, and people actually eat all the time, often as an activity to pass the time. There are a lot of food markets at night as well, which are extremely popular with locals and tourists alike. 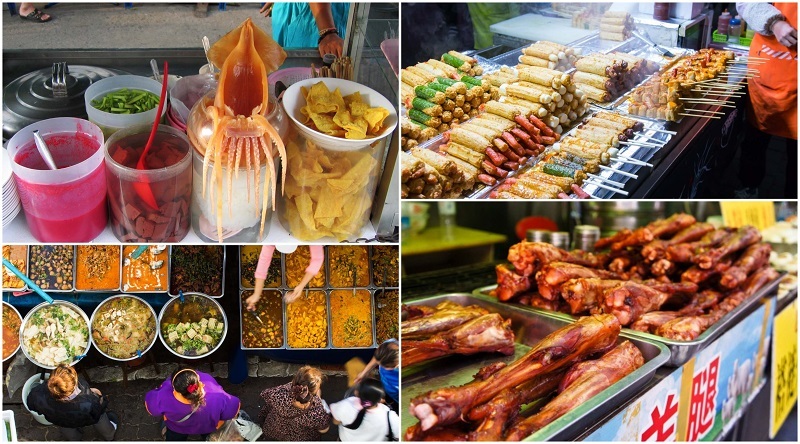 So instead of bar-hopping, you might as well try food-stand-hopping while in South East Asia. Street food in SEA is some of the best I’ve seen on the planet, but as Michelle rightfully said, I think this article makes it sound a bit underwhelming. Frankly, if you’re looking for authentic cuisine, some of the street food stalls will be far better than anything you’ll find in a restaurant. Thus far, the best street food I’ve found is in Pai, Thailand. Unlike larger cities, you don’t have to root through as much mediocrity, and because it’s somewhat of a hippie town, there’s street food from all over – I had some of the best Indian food I’ve ever had there! If you’re visiting SEA, street food is where it’s at. The article is informative. BUT. I would like to defend a bit on point number 3. I would agree that there can be a health issue, but that’s why you should try the newly fried one and not one that already sitting in the open. In addition, I’ve been to most countries in SEA and never have a problem with street food before. You can usually find a hidden gem in some of these food vendors. It also wouldn’t hurt to check food blogger specialized in that country. Tip: If you want to try street food, go where there is a lot of people waiting in line. You know the food is good and it is always fresh because it sells fast. I will never get tired of eating SEA food (being SEAsian myself). There are so many food choices to choose from, even if you’re in just one country. Each country in SEA has its own unique flavor that one must try when visiting. My personal favorites are: Chicken rice in Singapore, Adobo in the Philippines, Pho and fried rolls in Vietnam and Pad Thai in Thailand. More to be added in the list! This is really informative. Thank you for sharing your thoughts about Asia. I actually admit that SEA really loves street food even though I haven’t been in other parts of Asia since my first Asian trip will happen next year, I’ve watched a lot of documentaries about Asian foods and one thing similar about SEA is that, there’s really a bunch of foods on the street. You must be really adventurous when visiting Asia especially that it offers wide variety of foods in different places. I love street food, I think Thailand is a capital of such kind of food. I was surprised that sometimes a simple cheap dish is much more delicious than the one from fancy restaurant. I never tried insects, because there is always plenty stuff to try from satyas to rolls. Its not bad that sometimes you don’t want to eat Thai food, especially when you live in Thailand for more than 2 months. So for me its impossible to eat Asian food all the time. Western restaurants can be also good, you just need to find a good one.